Unconditional love, good friends and a gift. Painting is therapeutic to me. Whenever I feel stressed or impatient, painting grounds me. 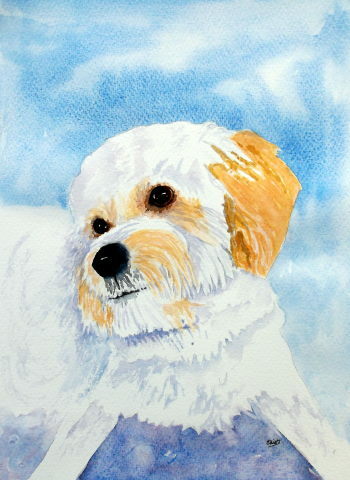 No subject more so than painting a dog. There is something about these most loyal companions that brings a smile to my face. That something is probably the unconditional love they have. In alignment with this unconditional love, I painted a dog portrait as a gift, for someone who is trying their hardest to make things right in my world. Painted on Bockingford Extra rough, size 15" x 11"
After painting the last two intricate sunflowers, I decided to paint a fast and loose, fun sunflower. This is on Bockingford Extra Rough and was created using watercolour, Graphik Line Painters and Ink. 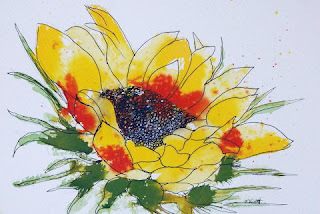 On my last blog post, I explained how I'd painted the sunflower in stages; that those stages reminded me of life. 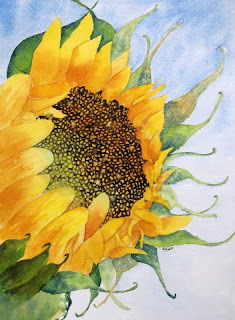 Painting in stages was quite relaxing, so I did it again - and yet again chose to paint a sunflower. I hope you haven't minded waiting!